Also Called: Buffalo bean, buffalo pea. Stems: Decumbent, extending 4-24 inches on all sides from crown, hairy. Leaves: Alternate, odd-pinnately compound, 2 to 5 inches long, 1/2 to 3/4 inch wide; leaflets 15-27, elliptic to oblanceolate, 1/6 to 2/3 inch long, less than 1/4 inch wide, sparsely hairy or glabrous above, hairy below; tips blunt or rounded. Inflorescences: Racemes, short, 5-25-flowered on stout stalks 1 to 4 inches long. Flowers: Calyces dark hairy; corollas papilionaceous, purple, light blue, or pinkish; banner prominent, 1/2 to 1 inch long, tip notched; stamens 10, 9 united, 1 free. Fruits: Pods, fleshy, smooth, spherical to egg-shaped, 1/2 to 1 inch long, purplish; seeds small, numerous, black. Habitat: Rocky or gravelly prairies, roadsides, and open wooded hillsides, most abundant on limestone or clay soils. 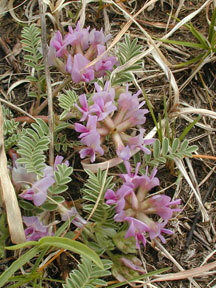 Toxicity: Ground-plum milk-vetch can be confused with locoweeds and poison milk-vetches, so it should not be eaten without positive identification. Uses: The Dakota referred to the fruit as "food of buffalo". The Dakota and Lakota used the fruits as a food source and the Lakota used the plant as medicine for horses. The fruit pods can be eaten raw or cooked.